If you're looking for the perfect place for your family to stay, look no further! This 5 Bedroom 5.5 Bath home is located in the Legends Corner community in the luxurious Reunion Resort. This property is nothing less than beautiful, being decorated to delight guests. As soon as you enter this beautiful home, you will be greeted with elegance and comfort. The living room is truly spacious with couches and plush pillows to ensure relaxation, surrounding a large TV. The kitchen is just off the living room and is perfect for large families, it is fully equipped with every appliance you'll need for your vacation. A cozy breakfast nook looking out the window is located next to the kitchen. In another room, just off the kitchen, is the warm dining room with enough seating for 12. On the second floor, there is a loft with lots of comfortable seating options along with a fireplace to keep warm on the rare cold nights in Orlando. There is a luxurious suite with a king-size bed located on the first floor with a large ensuite bathroom. The main king-suite upstairs has an ensuite bathroom and access to the second-floor balcony. Upstairs you'll also find a princess themed queen bedroom with private access to the balcony. There is another themed bunk bed bedroom with a space theme as well as an additional bedroom with two full-size beds that also has access to the second-floor balcony. Every bedroom has an ensuite bathroom and a personal large screen TV. The balcony has plenty of comfortable seating and beautiful views of a golf course. The garage has been converted into a game room for your complete enjoyment, with a pool table, table tennis, and Foosball. 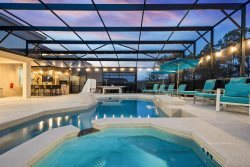 With a beautiful pool area to boot, this home is the perfect place for your vacation.